Commodore Neill Thomas joined the Royal Navy in 1963 and commenced his flying training in 1965. 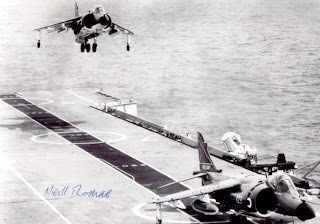 He trained on the Jet Provost/ Hunter and flew Sea Vixens and F-4 Phantoms extensively from the old Ark Royal before commanding the Sea Harrier HQ Squadron (Trials, Operational Training and Chief Tactical Instructor for the Sea Harrier). 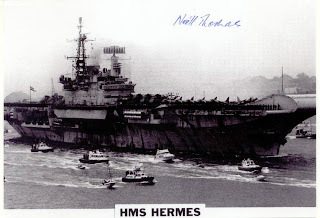 He was embarked with his squadron in HMS Hermes during Operation Corporate in 1982. Following attendance of the Joint Service Defence College in 1984 he served on Operational and Ministry of Defence Staffs before being appointed to the new Ark Royal in command of her Air Group (Commander (Air)) in 1990. He then carried out language training before his appointment to South Korea as Naval and Air Attaché. On returning, he studied at the NATO Defence College in Rome followed by appointment to the NATO Airborne Early Warning Force Command, initially as Deputy then as the Force Commander. He was awarded the CBE in 2000 and DSC in 1982. He retired from the Royal Navy in 2001.